If you’re thinking about adopting a cat, consider taking home two. Cats require exercise, mental stimulation, and social interaction. Two cats can provide this for each other. Plus they’ll provide more benefits to you. Cats’ purring has been shown to soothe humans as well as themselves – and they have an uncanny ability to just make you smile. A great place to start your search is online. Sites such as petfinder.com enable you to search numerous shelters in your area simultaneously to help narrow your search and more quickly find the match that’s right for you and your new feline friend. Make sure everyone in the house is prepared to have a cat before it comes home.Visiting the shelter or animal control facility should be a family affair. 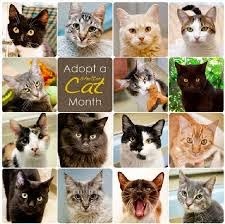 When adopting a new cat with existing pets at home, discuss with the adoption facility how to make a proper introduction. It is also important to start out on the right foot, with a good diet. The best diet for cats is a raw frozen diet if your kitty will eat it. Otherwise, use high quality grain-free canned food and try not to rely too much on poultry which can be a big allergen. Giving newly adopted cats Colostrum for Pets and Power Probiotic , is especially helpful as it will help to prevent worms and parasites, as well as strengthening their immune system.